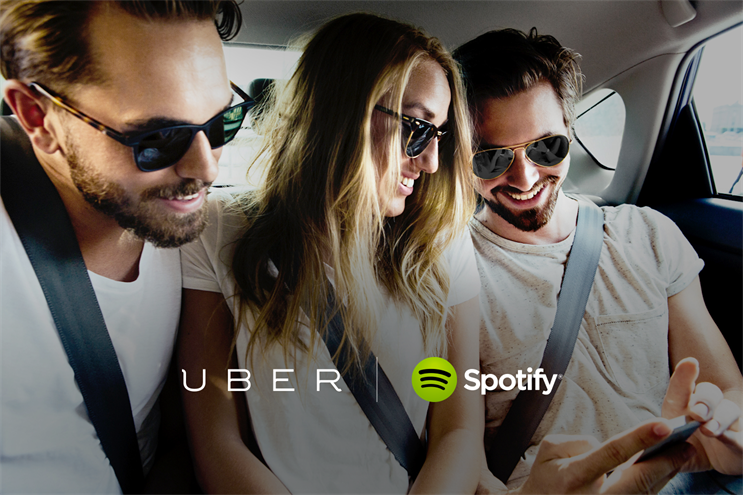 Uber, the cab app, has partnered with Spotify to create a service that allows passengers to control the music they hear during their taxi rides. The deal only applies to Spotify premium users who pay £10 a month for their account. Users who hail a participating Uber cab can select music from dedicated Uber and Spotify playlists, or pick their own music to play through the car's speakers. The service is available across 10 launch cities, including London, Singapore, San Francisco, New York, Stockholm, Sydney and Toronto. It isn't clear who may be benefiting financially from the deal, but the partnership could open up cross-marketing opportunities for the two increasingly high-profile firms. The deal will give exposure to Spotify, which may win more users in markets where it has yet to make much of a dent. The partnership gives Uber an added edge over US competitors such as Lyft, and European rivals such as Kabbee and Hailo. Both firms are fighting reputational damage, with Spotify battling the fallout from Taylor Swift pulling her entire catalogue from the streaming service. Swift has yet to comment on her decision, but it is thought to stem from her practice of "windowing" album releases – delaying a release online to maximise profits from physical and digital sales. Meanwhile, Uber is under the spotlight after senior vice president Emil Michael commented at a private dinner that his company should hire a team to investigate journalists who criticise his company. Michael has subsequently apologised. He said: "The remarks attributed to me at a private dinner – borne out of frustration during an informal debate over what I feel is sensationalistic media coverage of the company I am proud to work for – do not reflect my actual views and have no relation to the company’s views or approach."